As I write this article, on our first cold, breezy day, I can appreciate coming into my house and feeling the warmth! Just do One thing: Come to the Button Up launch event at the Woodstock Town Hall on Monday, Oct. 29, at 6:30 p.m. Ask about simple ways to insulate your home. There are many advantages of energy efficiency. Not only do we make our own homes more comfortable, but we also contribute to decreasing the amount of carbon in our atmosphere in an effort to put a brake on climate change. By weatherizing, we seal up the identified leaky areas of our homes, prevent heat loss, and thereby use less fossil fuel (oil or propane) to keep our homes warm (or cool). There are simple, low-cost things you can do to improve your home’s energy efficiency. The Green Resource Council, an organization that grew out of the National Association of Realtors (NAR) (http://greenresourcecouncil.org) recommends 19 things you can do on your own. Of these, seven will make a big difference during the upcoming winter season. Weatherstrip around doors and windows. Caulk window trim and around window panels. Hang thermal drapes or install insulated cellular shades to block or retain heat. Blown-in Insulation: Fiberglass, cellulose, or wool insulation that is blown in. It is often easier and less expensive to install than batts of fiberglass insulation. Foam-in-Place Insulation: A product that acts as an air barrier and provides insulation and air sealing in one step. Most foam insulation products have a higher R-value per inch than fiberglass batt insulation. Using foam insulation increases energy efficiency because smaller heating and cooling equipment is required. Efficiency Vermont (https://www.efficiencyvermont.com/products-technologies/insulation-windows-doors) is a valuable resource for learning about different kinds of insulation and finding a contractor to do the work. They also identify rebates that are available for homes and businesses. Can energy efficiency upgrades increase your home’s value? The simplest way to think about it is–as my mom always used to say, “With talk comes more talk.” As more people increase the energy efficiency of their homes and realize the benefits of lower energy bills and more comfort, the more people will seek out energy-efficient homes. The first step to determining the actual value of a home with energy efficient features is to get a copy of the “Residential Green and Energy Efficient Addendum” (https://bit.ly/2J8Skrk). You can fill out your home’s energy-efficient features and then give the form to your professional contractor to add what they have done. An appraiser who has learned how to value a home according to its “green” features, will use this form to determine actual value. You can find a local “green” appraiser at this website: https://bit.ly/2q4Hfil. Appraisers inform the home owner/seller and their real estate agent of the added value of their property due to energy efficient renovations. Locally, our multiple listing service through the efforts of the Northern New England Board of Realtors has been adding data-entry fields to identify green features and certifications. Being able to search the MLS for homes with green features helps agents search for sustainable homes and properties, and allows builders and sellers to market their green endeavors. Lenders are also recognizing the added value of homes with green features. A buyer looking for a mortgage should find a lender who uses informed appraisers. Energy upgrades both improve the value of your home and save you money. 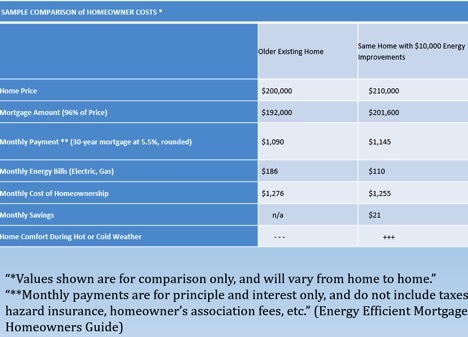 FHA (Federal Housing Administration) and VA (Veterans Administration) allow mortgages to include energy efficiency upgrades, so that, even with a higher mortgage, your monthly costs can be lower (See the chart below that references the energy efficient mortgage homeowners guide available at https://bit.ly/2NYcGEq).